No doubt about it: young people love the word “meta.” Just like we Nineties folk used to apply the suffix “esque” to everything. The point is: McHargue’s new paintings employ a number of old techniques to render the contemporary world an apocalyptic wasteland. There is hope, however. 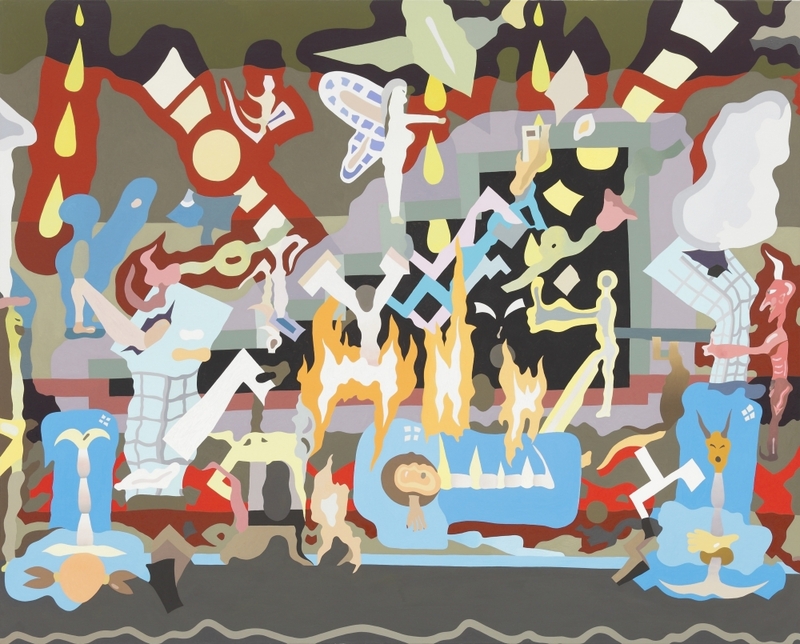 Topicality is the stated intent here, even as his most topical compositions, like The Well (2015), eschew straight narrative in favor of metaphor and exaggeration. Each painting is brightly-colored, most of them overlapping monochromatic hues, like sprightly mint greens touching piney colors, with dabs of chartreuse skirting the outer edges, as on Three Fish in the Morning (2015). The Well is more restrained, perhaps because it appears to be inside a stuffy legislative house. President Obama is at the bottom-center, head enlarged, eyes beady, mouth wide open, recalling both the distorted style of political caricature and, more sharply, Munch’s The Scream. Above the president are a host of figures arranged in an inverted “V” shape, starting with a panel of American gargoyles to the left. At the peak is a gavel-weilding judge with reading-glasses and a confused look, almost straight out of South Park. To his right is a police officer with a skeleton face and, depending on how you look at it, an American flag plunging into his groin or ejaculating from it. The final figure to the bottom-right stands profile, pointing an enlarged finger at the president, whilst sporting a scopic, sinister grin. The question of lampooning seems especially present in the aforementioned End Times (shown above). It is composed of figures that strike us as being part of a larger metaphor, ala Bosch’s 15th century paintings of hell and judgement. There are demons, winged goddesses, and chimeras that move throughout the canvas, which also boasts fountains, fiery lakes, and crimson shapes undergirding its backdrop. Each element is rendered simply and in a kind of bold, smooth oil technique that recalls Matisse’s late career cut-outs. There even looks to be a falling plane at the top-center; to the right, behind Satan himself, is a crumbling building with smoke billowing from its side. The whole thing could easily be mistaken for an art-brut-style take on 9/11—a kind of moral blending of the spiritual with the physical world. But my sense, once again, is that McHargue is doing something else. When we look at things like gods, devils, judges, presidents, and structures in the sobriety of daylight, it becomes much harder to take them seriously. They lose their power to be real. And, of course, they’re not, which McHargue’s style doesn’t argue. Meaning that we shouldn’t take things so literally… or be afraid to let them go either.